If the European Commission does levy billions of fines against the Italian government (or enforce some other punishment), some "60 million Italians will rise up" against the trade bloc - or at least that's what a clearly frustrated Deputy Prime Minister Matteo Salvini told a group of Italian reporters following reports that the Commission could move to punish Italy as soon as next week. The Italian people, Salvini added, would never accept those penalties, according to a report in Italy's ANSA newswire. And according to the latest polling, there's more than a little truth to that. As the 27 EU members who aren't the UK brace for the inevitable fallout for what increasingly looks to be a bumpy Brexit, one shocking poll revealed that 60% of Italians feel that their country has been mistreated by the European Union. If accurate, that's several percentage points higher than the percentage of Britons who voted to leave the EU back in 2016. According to Express, pollsters Coldiretti and Ixè found that some 43% of Italians believe that Brussels' economic policies were designed by stronger economies with little concern for weaker EU members. And fittingly enough, one of Italians' biggest concerns about the EU and its unfair treatment of Italy stems from policies related to agriculture. Two-thirds of Italians believe that the EU’s policies on food damage products made in Italy and only 10 percent believe the Italian agri-food sector is benefitting from EU choices. A spokesperson for Coldiretti said: "The clear majority of Italians therefore believe that community regulation and the recent choices regarding international treaties are not adequate to guarantee quality, safety but also respect for the gastronomical traditions of Italy." But the dissatisfaction runs deeper than food. Italians expressed their frustration with Europe when they voted for the League and Five Star Movement during the March elections. That vote, and the rising popularity enjoyed by both parties, represented what many believed to be a clear mandate: To shake up a relationship with Brussels that was no longer working for Italians. On Thursday, Deputy Prime Minister Luigi Di Maio told reporters in Rome that the EU is asking Italy "for a blood and tears budget," according to Bloomberg. "It is unbelievable that they don't understand our reality." But the intensity of Italians' anger toward the EU has apparently been lost on the European Commission. In comments that sounded lie they were meant to aggravate the situation, EC Vice President Valdis Dombrovskis warned in an interview with an Italian paper that Italy had defied the EU with its irresponsible fiscal policies, and threatened to sanction the country for its reckless spending. Meanwhile, Italy's leaders have insisted that abandoning plans for fiscal stimulus would be like committing "suicide." Disillusionment is particularly high among young Italians, who still struggle with high unemployment and other social ills. Support for leaving the bloc is much higher among young Italians when compared with young Europeans in general. 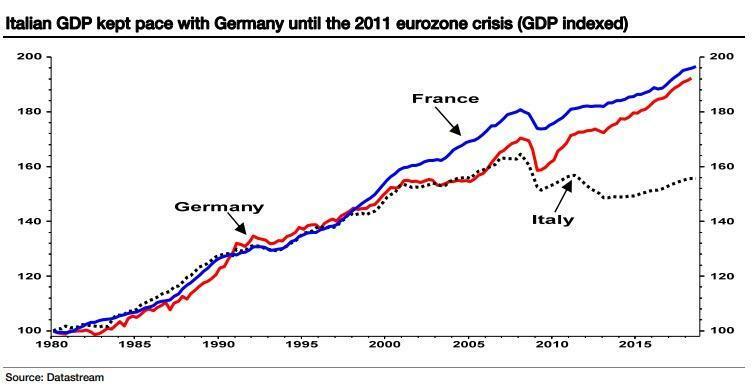 Interestingly, Italy's GDP growth had kept pace with Germany's until the 2011 eurozone crisis. 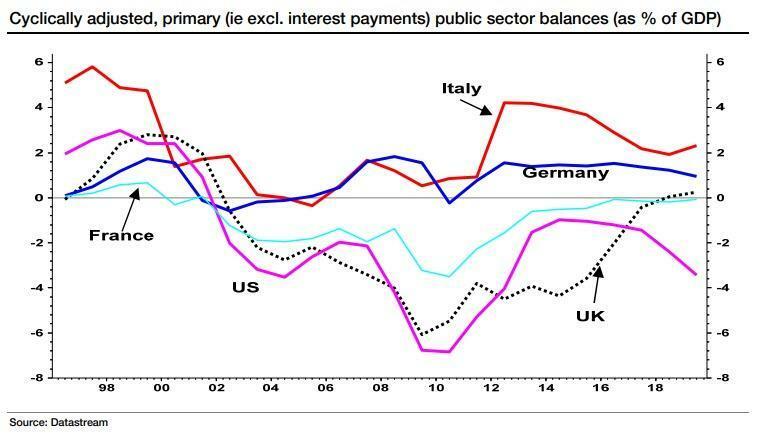 And as Albert Edwards explains, the EU's budget rules have consistently seen Italy run a budget surplus, keeping fiscal conditions tighter than they would otherwise be (the growth in Italian debt actually slowed after it joined the euro). Edwards compared these rules to a "fiscal straightjacket." Which goes back full circle to the austerity being imposed upon Italy by the EU: it is this fiscal straitjacket that the Italian government has been forced to wear over the last decade that has become intolerable to the Italian electorate (see chart below showing persistent large primary surpluses) according to Edwards, who notes that "it was only a matter of time before they broke free, but to be honest I am surprised it has taken so long for this confrontation with the EC to occur." The degree to which this tightening has occurred can be seen in cyclically adjusted government spending, which suggests that the country's fiscal impulse has actually weakened since Italy joined the eurozone. All of this certainly supports Edwards' expectation that if the contemporary populist regime doesn't take Italy out of the eurozone, the next crisis will yield a government that is even more fanatically opposed to the bloc's policies. In other words, it's not so much a question of 'if', but 'when'.